If you are using Whiteboard in your teaching then you should definitely consider these free resources from Scholastic. 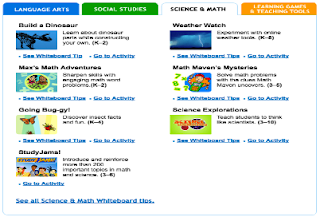 ‘Interactive Whiteboard Activities’ is a section in Scholastic where you can access a variety of interactive tools to use on your Whiteboard to engage students in different learning activities. These materials are organized into four main categories: Language Arts, Social Studies, Science and Math, and Learning Games and Teaching Tools.